Our first re-release from the dot9 backcatalogue. In traditional dot9 fashion its presented as a longplayer / mix (26 min). Gratis pulls you into a unique but familiar world. Filled with hectic and sombre moments, you’ll easily get lost. It’d be shameful not to point out the excellent programming, but its enviroment also deserves first mention. 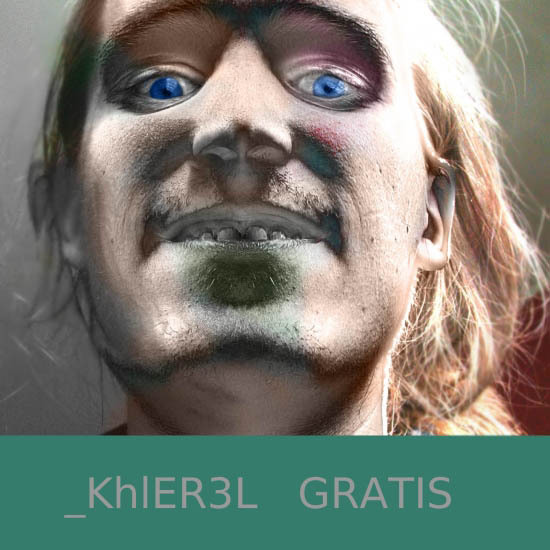 Put your headphones on and spend the next 30 minutes with _KhlER3L. This Gratis, my first mini-album, was originally released about December 10th, 2002. I’m happy to be one of the first releases on mutes ressurection of the dot9 vibe with his new offshoot, One. The idea behind Gratis was to put together something different from the usual Buzz release. I had spent a couple weeks listening to full albums, from beginning to end, and figured the extended format might be something new to try. The Buzz scene is mostly about releasing individual tracks, or sequences of individual tracks. Gratis was created from tracks, old and new, spliced together to form a whole. It isn’t perfect, but I hope it’s interesting enough for you to check out. All tracks were created in Buzz without outside postproduction, except a bit of arrangement and wave editing via Cool Edit. Some of the samples were heavily edited in external programs. If you haven’t tried Buzz yet, you should. It is an amazing peice of software that gets better every day. I have compressed the audio using Ogg Vorbis because it is way better than MP3. The file you are about to download is less than 10 megs, for 26 minutes of music. That’s an incredible ratio. What’s more, the quality is decent at those rates. Audiophiles will disagree, but so what? I think it’s a breakthrough for the scene. Now we can release albums and afford to host them ourselves. So, get to it! I can’t believe I forgot to greet. Greetz: boymeranq, pinkj, cyan, mute, nool, setz, boo, Devs: Jeskola (+++), SurfSmurf (matilde! ), Geonik (++), Zephod (voidbass+), cyanphase (++), Whitenoize (a ring mod in every pot), Joachim (Limit), Hal Dreamer (monsterkick), ld (jacinth), ninereeds, asedev (+), FSM (tunaman), PSI_Corp (kraft2), Zwar (ox! the most unknown gen) Rymix (stereobox), Automaton (2pole), Zu (parametric EQ), Rout (vibrato), YnZn (the remotes), Arguru (pro2), #buzz: clatter, bawk, apo, Hym, [jester], New Atom, Fire Cat, MORBIUS!, Roman B, WizKid, ichi, and the rest. _KhlER3L: Everything, except for unplaceable drum loops, bits off the television, and so on. CBC Radio Ideas: Vocal clips on et reet avi. From Massey Lecture Series. Click here for more information.